I cannot believe that I didn't post at all in 2014! Well hopefully that will change now. I have been on a stamping "roll" lately and need to get these posted to this blog then onto Pinterest. I LOVE Pinterest. It really gets my creative juices flowing and just looking at the different things makes me happy. I have a LOT of cards to post but will start with just a few today. Let me try to remember HOW to post first. Ok got it now. My good friend bought a package of Kraft embossed cards and wanted me to make her some cards using the pack. The biggest challenge for me was NO FLOWERS. Hellooooooo, most of my stamps are flowers. I did cheat with one and used a DP with flowers. Very small flowers and she loved it! It has been so long since I posted and I really have no excuse. I am retired and have all the time in the world. HAH!!! The days past so swiftly with nothing accomplished. I did recently have a good run of creativity so I will post on here. I also recently discovered Pinterest and have spent a LOT of time on there. This Thank You card is one of my favorites that I recently did. I handpainted the little flowers and used that as a focal point and use some of the DP and buttons that I have been hoarding forever. The SU cardstock is retired and I love it so what will I do when it is gone? Big sigh. Here is the card that was posted on the SCS Facebook page. It was for the Ways to Use it Challenge to use markers.... 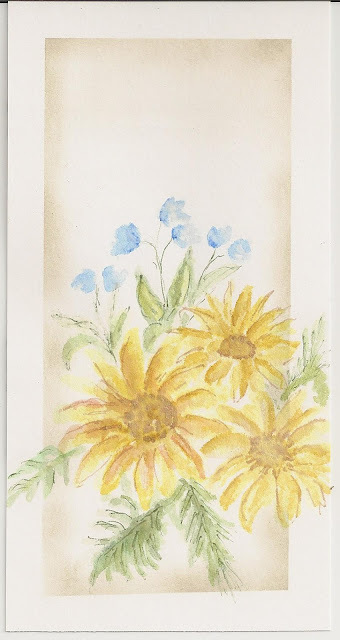 I chose to freehand watercolor some flower images. Wow! I am soooo happy! I had not one but TWO of my cards listed as Favorites for the Week ending 9/15/2012 on Spitcoast Stampers and a the 3rd card I uploaded was featured on the SCS Facebook page. Well, that makes me a happy camper and I will keep on stamping. Trying to build up a stash of Baby cards. I just love the woodgrain look. I CASED this card but that's ok I guess, it is not an exact CASE at least. I left off the sentiment for now, will put one on when the occaision arises. Let's try this again, wiped out my last 2 posts and sent them to LaLa Land I guess. Made 2 bookmarks for the Try a New Technique Challenge at Splitcoaststampers.com. Easy Peasy. Cut a strip 2" x 11". Fold in half, glue or sew the top 1/2 inch so that the bookmark doesn't open too much, then decorate. Love it! Good afternoon!!! It is HOT and no sign of it cooling down. My husband was out cleaning the inside of the car but finally gave up and came inside. Way too uncomfortable! I finally found the time to work on the Wedding Card Challenge. This is different for me. I usually make all white or fru fru wedding cards. I found this stencil when I was clening up my desk so I decided to use that as a base. This week, because it has been sooooo hot everywhere, the weekly challenge was to make a card that is "cool". I have had this stamp on my desk for a long time and thought I had better use it because I was tired of looking at it. I do so love the little mouse and can just hear him saying " ahhhhhhhh!" The sentiment is computer generated. Thanks for looking! Oh, and Lisa, I figured out (I think) how to take of the word verification, Let me know if it worked. Card #3! This was actually the 1st card I attempted to make and it just wouldn't come together. I am not happy with the result, I should not have put the black ribbon on there and I should have stamped the sentiment in black. Look Lisabella, PINK!!! LOL. Woohoo! another stamping day. What fun! I bought 3 Tag stacks the other day at Michaels because they were in the clearance aisle. I didn't know what I was going to do with so many but they were on SALE! What was I to do? So here is the 1st of the 3 cards made. My sister Janie came over one day and wanted to make some Christmas cards. She reminded me that I wanted to start making Christmas cards early, so we agreed to spend an hour or so each month. I only made 2 cards both more or less the same, but I guess that is better than nothing right? Bill and I have been married for 32 years. We have no children together and no pets if you don't count the various critters that inhabit our property. We enjoy fishing and hunting together and just sitting on the deck watching the wildlife.